Study: predator-prey relationship affects carbon cycle. June 18, 2013. When most people conceive of the causes – or “forcing” – behind climate change, they think of volcanoes, solar radiation and, increasingly, human industry. Those who are more informed might also imagine forests, or perhaps the noxious emissions of 1.3 billion cows. However, pioneering research has increasingly revealed that biological activity on small scales, replicated in countless interactions across the planet, can yield equally substantial influences. Carbon is, of course, both a fundamental component of life and a major contributor to global warming. Countries across the world have invested billions in storing surplus carbon, yet lucky for us plants and animals also absorb carbon in vast quantities. To investigate that process, lead author Michael Strickland and other researchers at the Yale School of Forestry and Environmental Studies have recently re-examined how relationships between animals and plants affect the passage of carbon through the food chain. Their study, released this week in the journal Proceedings of the National Academy of Sciences, explores how predation and fear in grasshoppers and spiders influenced carbon storage in controlled ecosystems. Some ecosystems housed only grasses and herbs, others introduced herbivorous grasshoppers, and a few contained all three tiers of the food chain: plants, herbivores, and carnivorous spiders. Traceable carbon dioxide was introduced into each ecosystem, allowing the researchers to periodically measure carbon levels. The study revealed that the lowest rate of carbon absorption occurred in the ecosystem featuring only grasshoppers and plants. If the grasshoppers were removed the rate of carbon absorption increased by 20%. However, if both grasshoppers and spiders were present, carbon storage was 40% higher than it had been when only grasshoppers accompanied the plants. 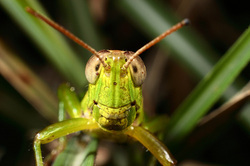 Fearful grasshoppers consumed less vegetation when spiders were present, and shifted towards eating herbs rather than grass. In turn, grass stored more carbon in their roots than it did when neither herbivores nor carnivores were around. The “multiplier” effects of predation are rarely considered in models that project future climates, and do not feature at all in the assessments of the influential Intergovernmental Panel on Climate Change. However, the Yale University study belongs to a growing body of work suggesting that predators increase the carbon absorption of an ecosystem. By exterminating top predators across the globe, we might actually be making the world less hospitable for the creatures they hunt. Sadly, it is a familiar irony in the study of anthropogenic climate change.